There is one big difference, however. This package is being executed from within the SSIS Catalog on the container and not from the file system. No. There’s more I’ve learned but haven’t (yet) shared. SQL Saturday #813 – Boston BI Edition on 30 Mar 2019 and learn what new and exciting things they’ve discovered since we last hung out. The TFA team has done amazing work. Liz and Sreeja are delivering an information-packed session titled SSIS DevOps with Azure Containers on this very topic. I can hardly wait. I do not (yet) know how to deploy to a container using the Integration Services Deployment Wizard. This bugs me and I want to figure out some way to do it because deployment testing is critical for SSIS. I have not figured out how to execute SSIS packages in an SSIS Catalog in a container using the SSMS Object Explorer’s Integration Services Catalogs node. I know how to execute them from the SSIS Catalog (the topic of the next post) – both using PowerShell. Returning to Matt Masson’s PowerShell script – combined with the docker volume added earlier – I have a means to deploy an SSIS Project to the SSIS Catalog in the container. The best way I know to deploy SSIS projects to an SSIS Catalog in a container is using PowerShell. Next we tackle executing SSIS packages deployed to an SSIS Catalog in a container. 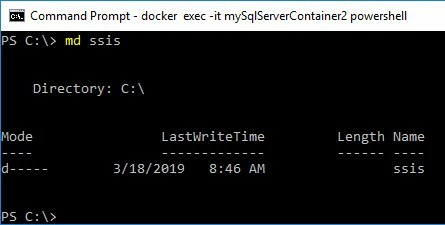 In my previous three posts I’ve examined how to install Docker for Windows, pull a test image, search for a SQL Server on Windows image, install and interact with it (Part 0). I’ve shared why I want to do all this (Part 1). And I’ve shared one way to execute SSIS on a container in Part 2. This attempt at creating an SSIS Catalog on a container does not succeed. The next post in this series shows how I succeeded in this portion of the task. If you want to skip this post and go directly to SSIS, Docker, and Windows Containers, Part 4 – Adding an SSIS Catalog, Attempt 2, we can still be friends. Promise. Did I become discouraged? Yep. Did I want to give up? Yep. Did I give up? Nope. I made the-problem-I-was-trying-to-solve give up first. The most important reason I wrote this, though? Someone out there probably knows how to make this work. They will read the post and think, “Andy, you idiot! This is what you need to do to make this work.” Hopefully they will then share this in the comments (you can skip the “idiot” part, though. I already know that…). How then can we create an SSIS Catalog? It turns out there are a few ways to accomplish this task. PowerShell is one of the ways. You can find lots of good explanations and walk-throughs about how to provision an SSIS Catalog online. I narrow my search considerably by adding the required (in my opinion) search term “mattm” – short for Matt Masson – who was on the SSIS Developer Team that built the SSIS Catalog and who also blogged about the SSIS Catalog. Matt has since moved to another team inside Microsoft. That is not Matt’s fault. Matt’s a genius. Trust me. On my laptop I created D:\docker\install as shown here. 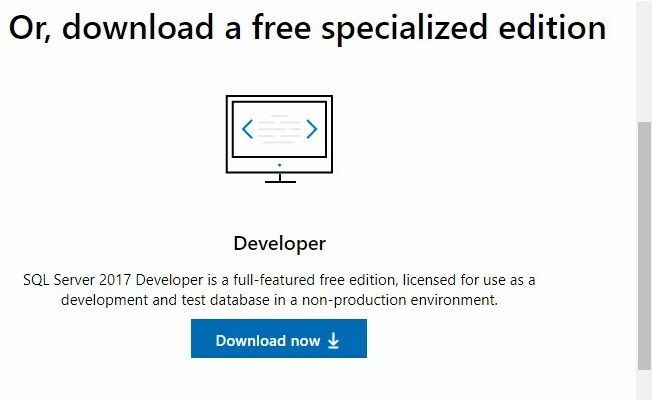 I blogged about one way to install SQL Server 2017 Developer Edition if you’d like to learn a little more. But I warn you, this post doesn’t describe many configuration options and should not be used to configure a production SQL Server 2017 instance. Docker run creates a container for us that has 2G RAM and its C:\install directory is mapped into our D:\docker\install directory on the host. 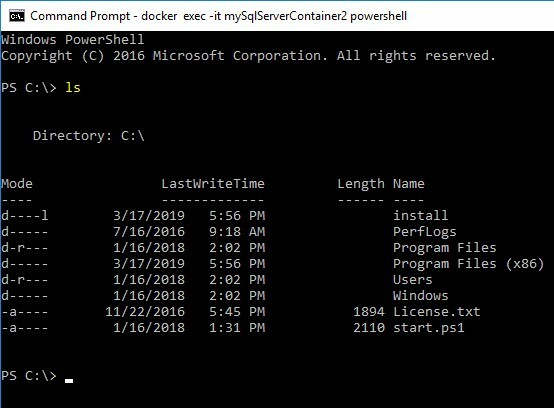 I have to tell you, this functionality beats the dickens out of transferring files into the container using PowerShell (as demonstrated in Part 2)! As you can see, if we want to add files that are accessible from within our container, we merely add them to our host directory. It appears we have an SSIS Catalog on our container but looks can be deceiving. As mentioned near the top of this post, we have not, in fact, created an SSIS Catalog in our container. As ever, we need to test and see. 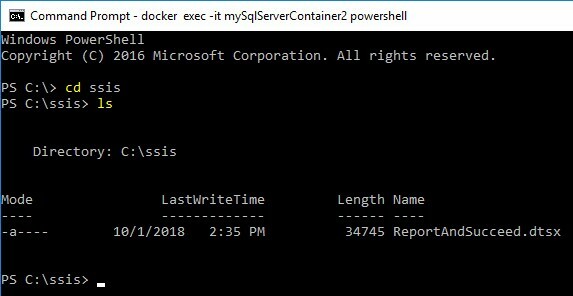 In my last couple posts I’ve examined how to install Docker for Windows, pull a test image, search for a SQL Server on Windows image, install and interact with it (Part 0). I’ve shared why I want to do all this (Part 1). 3. This is not my ultimate goal. Note we are standing up a new container named mySqlServerContainer2. We are also adding a switch to boost the memory in this container to 2G – the -m switch does this for us. At least one of the DTS, SQL, ISServer or File options must be specified. The “ISServer” option appears only in SSIS Catalog-aware versions of dtexec. There is no SSIS Catalog created on this version of the container. Bummer. But, we can execute an SSIS package from the file system. Let’s copy an SSIS package to the container and execute it! I remind you: This is not the only way to access an SSIS package on a container. I share a better way in the next post in this series, in fact. But this is one way. If you’re playing along at home, exit PowerShell in the container by typing “exit”. 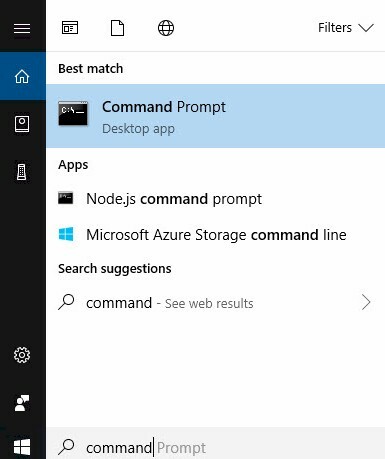 To complete the next steps, start Command Prompt on your host machine as an Administrator. I accomplish this by searching for command prompt in Windows 10, right-clicking it, and clicking “Run As Administrator”. … to the C:\ssis directory on the container. This SSIS package was written in an earlier version of SSIS. Each version of SSIS uses a specific version of Visual Studio Tools for Applications (VSTA), which requires .Net script object code – found in the Script Task and Script Component – be migrated to the current version of SSIS prior to execution. We get one Info message for the .Net code migration operation, followed by a second Info (Information) event message. The message displayed in the Description of the second Info event reports: “I am ReportAndSucceed”. While executing SSIS packages in a container from the command line is helpful, it does not achieve my ultimate goal: Executing SSIS packages in the SSIS Catalog in a container. In the next two posts I share an unsuccessful attempt to create an SSIS Catalog in a container followed by a successful attempt . SSIS, Docker, and Windows Containers, Part 1 – Why? 2. One way to get answers to questions no one wants to hear. My ultimate goal is to use one or more Windows containers running SQL Server to test SSIS. I can hear some of you thinking,.. Seriously, since I hopped the fence from developer to data I’ve dreamed of the day when I could practice lifecycle management with data-stuff like I used to practice lifecycle management with software development. A database, on the other hand, is all about that state. When it comes to managing lifecycle for a stateful platform – like a database – ACID gets dumped on many lifecycle management tools and solutions (see what I did there?). Your team releases an update that adds one column to one table. The column receives data. Someone realizes there’s a bug and determines a rollback is the solution. The web and middle-tier teams successfully rollback the release using functionality built into the release-management / DevOps enterprise tool. What happens to the column in the table? Since this isn’t a post about data lifecycle management, let’s not even consider what happens if the data is considered personal-identifying-information or some tuple otherwise subject to privacy regulations. This is the problem I am trying to solve, specifically for data integration. I want to be able to easily deploy and rollback data integration deployments. But to accomplish this, I need more metadata (data about the data) and a bunch more automation. Why? My stuff has state – by definition. If you have not yet figured this out, Microsoft is a software development shop. They’re people trying to use software to solve business problems for customers – just like you and me. Just like you and me, they have schedules and deadlines and competition and a need to generate a profit. in other words, Microsoft is a business. When some redneck from Farmville Virginia starts asking all sorts of out-of-scope questions, he sometimes hears, “That’s not supported, Andy,” in response. Ask me how I know. So it helps to be stubborn persistent. Persistence sometimes takes the form of thinking of another approach. When I began probing for ways to test SSIS in containers, my ultimate goal was to have the tests simulate Production as closely as possible. In 2019, Production SSIS means executing SSIS in the SSIS Catalog. Is it possible to execute Production SSIS from the file system or the MSDB database in 2019? It is. I’ve not found a good use case for executing SSIS outside the Catalog, though – not in 2019. I am not trying to hurt anyone’s feelings, I promise. I’m just saying that the SSIS Catalog has been out for north of six years at the time of this writing. Plus: The only way to execute Azure-SSIS packages is via an SSIS Catalog in the cloud (again, at the time of this writing). At Enterprise Data & Analytics we help clients migrate from file- / MSDB-based SSIS execution to the SSIS Catalog (both on-premises and Azure-SSIS). Some clients realize the benefits of SSIS Catalog-based execution and call us for help with training and consulting. Others ask for help performance-tuning SSIS, and we almost always recommend using the SSIS Catalog because SSIS packages almost always execute faster when executed from the Catalog. When do we not recommend using the SSIS Catalog? Some enterprises have designed their data environments in such a way that using the SSIS Catalog would require a major shift. The technical portion of the shift would be relatively straightforward, but – often – the cultural shift is more disruptive. Not all enterprises are willing to make such a cultural shift; to endure the disruption. Fine. What is supported? 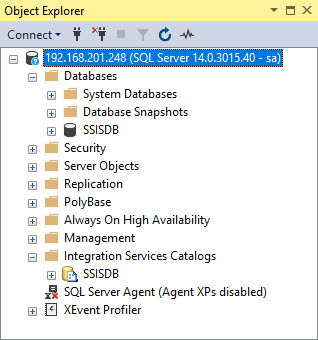 Running the SSIS Catalog on SQL Server installed on Windows Server Core. I was trying to solve many of the same problems in a container that would need to be solved running an SSIS Catalog on Core. It turned out many of these problems had indeed already been solved. If you can make it to SQL Saturday #813 – Boston BI Edition on 30 Mar 2019, Liz Baron and Sreeja Pullagura are delivering an information-packed session titled SSIS DevOps with Azure Containers on this very topic. I’ve had the privilege and honor to work with Liz, Sreeja, and the awesome data engineering team at Teach For America – a worthy non-profit. I predict Sreeja’s and Liz’s presentation is going to be a session that moves the needle for Data Integration Lifecycle Management (DILM). My next several blog posts on this topic – sharing some of my efforts and what I’ve learned about executing SSIS using containers – will begin appearing 31 Mar 2019. Shameless plug: I am delivering Intelligent Data Integration with SSIS – a full-day pre-conference training session – Friday, 29 Mar 2019. In my next post I share one way to execute SSIS in a container. To begin tinkering with SSIS in containers, you first need to install Docker. There are some prerequisites. I will not exhaust the prerequisites here. 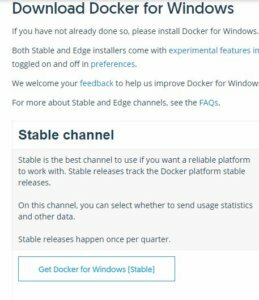 I strongly suggest you familiarize yourself with the requirements for Docker prior to attempting to install the software. 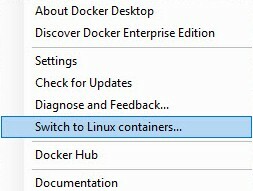 Since I use a PC (a Lenovo P51S) running Windows 10 Pro, I chose to use Docker for Windows. 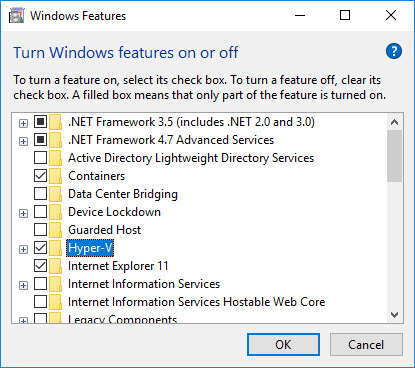 I decided to switch to Hyper-V, though, and rebuilt my demo and development virtual machines in Hyper-V. The cool kids are using Linux containers, especially the cool SQL Server kids. I’ve tinkered a little with SQL Server on Linux. I’m interested in SSIS, though, so I’ve been focusing on running Windows containers in Docker for Windows. Containers are like lightweight virtual machines. They typically consume less disk space. Containers spin up relatively quickly. A developer can configure a container, persist it in some state, and then turn it off. It’s faster and lighter than working with a VM. There are other benefits that we will get to later in this series. After installing Docker, your next step is pulling an image. An Image is an ordered collection of root filesystem changes and the corresponding execution parameters for use within a container runtime. An image typically contains a union of layered filesystems stacked on top of each other. An image does not have state and it never changes. I can now hear you thinking, “Umm… what?” I think of an image as a pre-configured container. What’s configured in the pre-configuration? Well, the operating system and other software I may want to use. Re-pull the “hello-world” image to show how things look when the image is up to date. As stated earlier, the hello-world image is a test. -e == env list, which sets a container’s environment variable(s) to a value (or values). If you saw that long hex number, your SQL Server Windows container started. It’s a brand new container – it still has that new container smell. There are a few ways to interact with this container. Let’s look at one, PowerShell. Cool? I think so too. 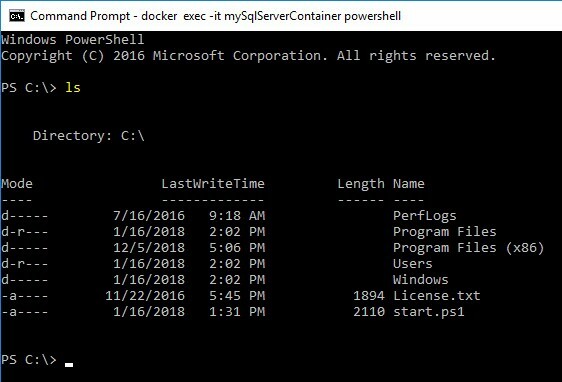 I’m going to stop here because this post is long enough and this is enough to get you started using SQL Server in a Windows container. That was my goal today. In my next post – SSIS, Docker, and Windows Containers, Part 1 – Why? – I explain why this is important (to me, at least). Run a container with the microsoft/mssql-server-windows-developer image (assign lots of RAM). 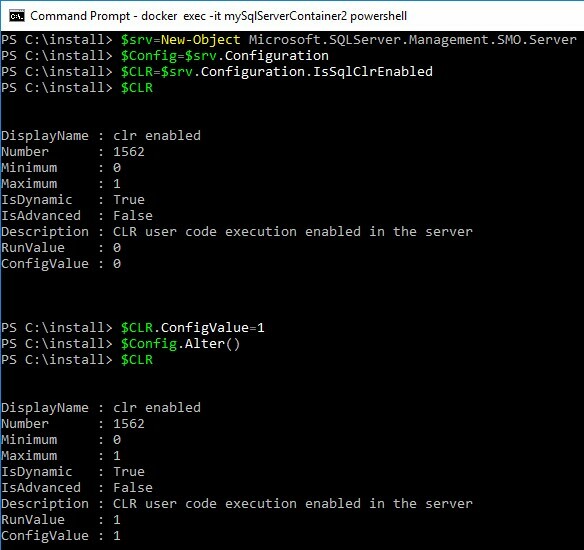 Add the SQL Server installation files to the container. Execute SQL Server setup from a command line configured to add Integration Services (this is why you need the RAM). Execute from the command line (dtexec). SSIS Catalog in a Container? Calm down, will ya? I’m working on it. I’ve benefited from some great advice and help from Ned Otter (nedotter.com | @NedOtter). I caught Ned’s presentation on containers at SQL Saturday Boston 22 Sep 2018. I’d seen other presentations on containers and learned a lot. Ned’s session put me over the top. Above is a screenshot of an SSIS 2017 Catalog hanging out in a container. In this state I cannot do much with it because I am connected using a SQL Server login (even though said login is sa). I write “create” in quotes because I “created” the folder in an unconventional manner (executing pieces of SSISDB stored procedures). 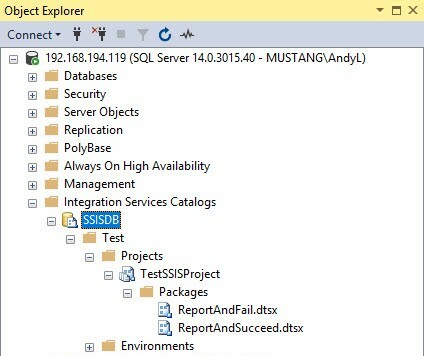 I may be able to deploy an SSIS project – again, via some creative combinations of pieces of SSISDB stored procedures. If so, I doubt I will be able to execute an SSIS package in this Catalog. The only way I can think to accomplish this is to bypass some Catalog security checks which means there is a distinct possibility that important steps will be missed or skipped. My gut tells me this would be bad. 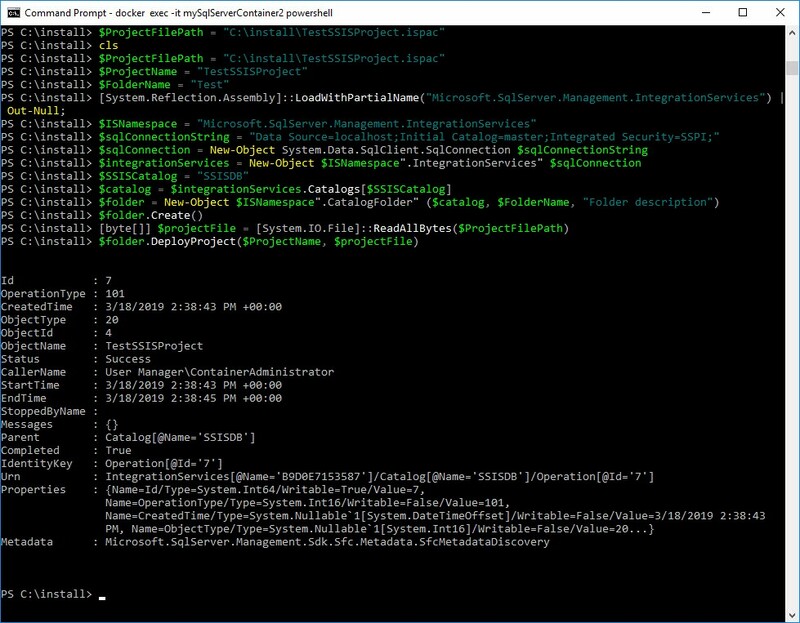 The best path forward is to find some way to connect to SQL Server in the container using Windows Authentication. I’ve been communicating with my brother and friend, Brian Kelley (truthsolutions.wordpress.com | @kbriankelley) about this but have yet to solve it. I plan to publish the image once I figure out how. I am excited about executing SSIS in a container from the command line, though. Very excited.